Discreetly straightening teeth is easier to accomplish since alternatives to traditional metal braces have become available. 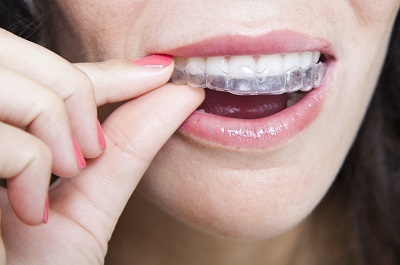 The Invisalign® clear aligner system once used only to correct mild dental misalignment, has proven to be a popular and effective choice for many patients. Dr. Shu Ping Rong provides Invisalign clear braces to teens and adults in Lower Manhattan. Call us today for a consultation! Dr. Shu Ping Rong provides a full range of Invisalign options at her Manhattan dental office in Chinatown and is uniquely qualified to address your teeth straightening needs. Her expertise and experience with traditional braces and a variety of Invisalign products allow her to assess your smile and make the appropriate recommendation. Standard Invisalign – The original clear aligner system which provides a straighter smile in 12 to 18 months. Invisalign Teen – Treats alignment issues in teens who need help complying with treatment requirements. Invisalign Express – Addresses mild teeth alignment problems, with treatment often being completed in under a year. Dr. Rong streamlines the entire Invisalign system process for the benefit of her patients. She works closely with the Invisalign lab and clearly illustrates the projected results. We start with digital impressions on your first visit, and within three weeks, you will receive your first four sets of clear trays. Dr. Rong thoroughly instructs patients on the importance of compliance and proper care guidelines. Aligner trays must be worn 22 hours every day and only removed when eating, brushing, or flossing. We recommend you return every two months for follow-up visits where you receive your next set of trays. To meet your needs, our dentist can design a treatment plan that utilizes traditional braces first to better prepare your smile for the Invisalign system. Dr. Rong stands by her work and is dedicated to helping you achieve the smile you desire. In addition to being an effective and virtually invisible orthodontic appliance, the customized Invisalign trays can be used with professional teeth whitening gel, leaving you with a brighter smile. For those who are eligible for this option, we offer free teeth whitening for life. If the way your smile is aligned negatively impacts your confidence, we provide precise and efficient treatment. Call today for an Invisalign consultation at our Manhattan office near Chinatown.